How many brain cells do we have? Can we get new ones? We know that children develop new brain cells as they grow (although we may wonder at times if they use any of them). The growth in head size also involves growth in brain tissue to fill the space inside. We are learning more about brain development in adolescence that give rise to some troubling questions about limits of personal responsibility. But what happens when we reach adulthood? It is commonly believed that we only have so many brain cells, and we cannot grow news ones as adults. Vincent and Lledo offer strong evidence that this is not the case: We can and do grow new brain cells under certain conditions. The book opens with the standard evolutionary tale of development, but with some interesting twists. The authors argue that compassion was a result of evolution, allowing groups to survive through mutual cooperation and caring, a story certainly at odds with the “survival of the fittest” mantra of the movement. A great deal of effort is expended in chapter two to argue for an evolutionary narrative regarding brain development. Unfortunately, there is no detailed information offered about how these processes occurred. In addition, some interesting language is used to describe evolution. It is not pictured as the random, directionless phenomenon that is the current model. The authors ascribe direction and purpose to the evolutionary process. Frequent references are made to evolution as a conscious, active process. In one place, they write, “Evolution still needed to risk a few more decisive innovations.” They clearly state their rejection of the supernatural, but seem to invoke some sentience to this seemingly non-supernatural phenomenon. Evidence of the complexity of the brain is presented in great detail in chapter three. Here we see the intricate structures that make up the brain and learn about the many processes controlled by this roughly three pounds of tissue. This chapter serves as an excellent primer for those who need some introduction to brain structure and function. The idea of adult brain plasticity (the ability to develop new brain cells) is relatively recent, first being broached in the late 1970s and early 1980s. Initial research focused on animal studies, with the book giving a fascinating account of how hormonal changes in male canaries (triggered by the changing light availability throughout the year) produced different singing patterns in different seasons. Other work is described dealing with brain development during adolescence and early adulthood that has serious implications for educational and mental health policies. Mental disorders and dementia are two growing concerns as we learn more about brain development in adults. In 1990 President Bush established the “Decade of the Brain” program designed to bring greater awareness to issues related to this important organ and to stimulate research in this area. In chapter five, the authors provide a very informative overview of the neurology and pathology of the brain as it changes during aging. Useful information is given that deals with degenerative brain diseases (such as Alzheimer’s disease) and current approaches to treatment. Little coverage is offered for mental illness, with the suggestion of developing drug treatment based on individual situations as the only solution being offered. Other topics of interest deal with phantom limb phenomena and brain changes produced by stress (both topics worth considerable exploration on their own). Chapter six could be considered science fiction except for the fact that many of the brain enhancements talked about already exist. While there are undeniable benefits to many of these developments (devices that facilitate communication, approaches to pain regulation), there are also significant ethical issues involved. The ideas of “brain doping” (the use of chemical substances that affect behavior) and nanotechnology (ultra-miniature devices that can actually enter the brain) certainly could be helpful for some individuals, but also bring up serious questions about how these techniques would be used and how abuses would be curtailed. The book provides an excellent and extensive collection of notes and references at the end. This material would allow the serious student to explore in great detail the topics covered in the book. 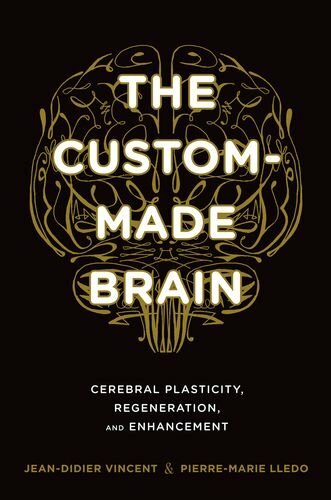 The Custom-Made Brain furnishes us with a fascinating narrative about brain structure and development along with some challenging issues related to future developments and possibilities.